See this screenshot of the book "Basic Simple Type Theory". The infinite sequence they refer to is just a way to formalize the concept of having enough variables to work with no matter what. In my case, for practical reasons, all my variables are single unicode chars. I forsee for the next 100 years, that to be plenty of mathematical variables to work with. What do they mean by the last line? 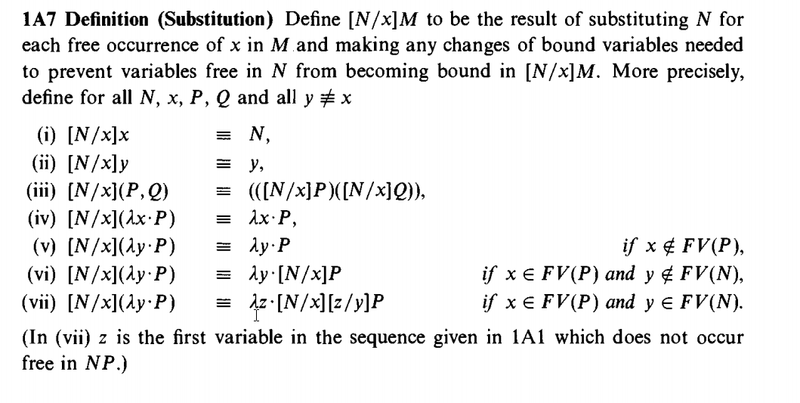 Do they mean the first non-free variable including any bound variables within $(N P)$? Or do they mean the first "open, unused, available" variable in all of $(N P)$ including any abstractors $\lambda w$? My guess is the latter, since $z$ is a dummy variable and of course this can't interfere with other variable useages. Browse other questions tagged algorithms computer-science math-software lambda-calculus type-theory or ask your own question. What does it mean to say a language is context-free? Can Horn's algorithm be generalized for all logic expressions? What does $0^-$ mean in set or type theory? What does the “£” symbol mean for the following equation? What does the type theory of a free-category-over-M look like? Does the “Every epimorphism splits” form of the axiom of choice imply LEM in constructive type theory? Does Diaconescu's theorem imply cubical type theory is non-constructive? In Homotopy Type Theory, where does the lambda expression reside?